A big cheers to The Beer Junction in West Seattle for 3 years of making Seattle a better place for beer geeks! 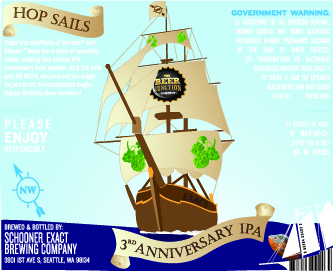 They will be celebrating this Thursday, June 27, and to mark the event Schooner Exact has crafted a special 8.3% ABV Double IPA called Hop Sails. Schooner Exact will be on hand for a brewers night Thursday as the beer is being released. Celebrate Three Years At The Beer Junction! July 3rd, 2010. That’s when we opened up our doors at 11AM at our original location (4707 42nd Ave S.W. ), just around the corner from our current expanded space (4511 California Ave. S.W.). Three years is a big milestone for a small business. It’s the point you’ve on average broken even and are hopefully headed in the right long-term direction. We are excited to have (almost) passed this mark and are so thankful for all of our customers, employees, and friends who have helped us make it this far! Starting this Thursday, June 27th, we’ll begin our weekend long anniversary celebration with a special bottle release and keg tapping of our 3rd Anniversary Beer brewed by our friends at Seattle’s Schooner Exact Brewing Company! We don’t need to say it, but Schooner Exact knows how to make great beers. Their flagship 3-Grid IPA has been one of our top 10 selling beers each of the past three years. We approached Brewmaster and Founder Matt McClung on brewing an anniversary beer this past winter. Several ideas were discussed, but we kept coming back to brewing a great double IPA, especially in light of our anniversary being in the summer season. The Label: Nick Bers, one of our long-time bartenders and on-the-side graphic artists created the initial sketch. Schooner Exact Co-owner, Heather McClung, took the sketch and turned it into the final product, including a small (but if you look for it noticeable) rendition of our store pet- The Oscar fish! Thursday June 27th Bottle Release and Keg Tapping! Starting at 11AM, bottles of Hop Sails will go on sale for $6.99 per 22oz bottle. Purchase a whole case of 12 bottles and receive 10% off ($75.49), plus a limited 3rd Anniversary T-shirt! At 5PM we’ll be tapping the very first keg of Hop Sails. That leads into our brewer’s night with Schooner Exact. In addition to Hop Sails, Schooner Exact will also be pouring the first keg of the most recent batch of Hopvine IPA, along with their current seasonal Seamstress Union Raspberry Wheat, 3-Grid IPA, and King Street Brown. Sample all five of these beers from 5-8PM for just $4! For all purchases over $40 (made Thursday June 27th through Wednesday July 3rd) receive a free Beer Junction pint glass! For all purchases over $100 receive a free Beer Junction t-shirt of your choosing! To continue the celebration, we’ll also be putting on some special kegs from the cellar throughout the weekend, including Deschutes Black Butte 24th Anniversary Bourbon Barrel Aged Imperial Stout, Great Divide 19th Anniversary Wood Aged Strong Ale, and Harviestoun Old Engine Oil Special Reserve! Cheers and thanks for all your support! Tonight (Wed. 6/26) at 4pm The Beer Junction is also tapping a keg of Dogfish Head 120 IPA.